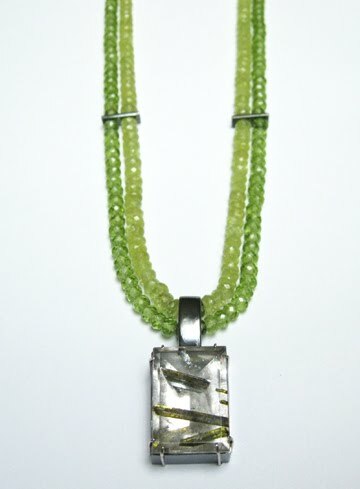 I would be the first to admit that green is one of my favorite colors and green stones are no exception. The green bands within this emerald cut quartz is created by the presence of Epidote, a mineral. 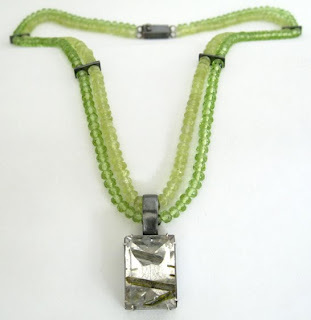 The lighter green beads are very lively chrysoberyl, some with cat's eyes, and the bright green are peridot which also happens to be the birthstone for August. The setting and spacers are oxidzed sterling silver. Both strands of beads have been handstrung and knotted to lay close together. 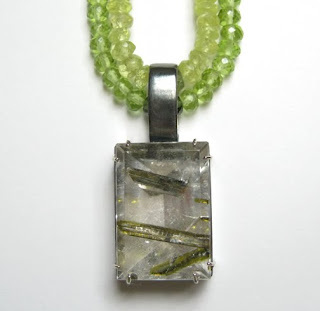 This necklace is part of a small collection I am making for Tayloe Piggott Gallery in Jackson, Wyoming.